The People’s Front party founded by Ukrainian Prime Minister Arseny Yatsenyuk and allies has effectively thrown in the towel, annnouncing that it will not participate in local elections on October 25, 2015. The move follows a catastrophic drop in ratings to under 3%. 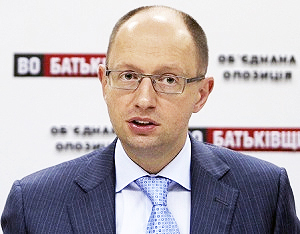 “People’s Front party will not field candidates in local elections,” Yatsenyuk announced on August 28. “The party has conducted reforms and will continue to do so, but these are not national but local elections, and the Ukrainian people should elect new representatives to the local councils,” he told media, adding that it was also important that Ukraine avoid “any split in the democratic camp”. The move comes as a fresh poll by the Kyiv International Institute for Sociology found that only 2.8% of respondents would vote for Yatsenyuk’s party in elections, effectively making him the scapegoat for Ukraine’s continuing economic collapse. People’s Front has seen a meteoric rise and fall in less than a year. Founded by Yatsenyuk and allies in September 2014, only weeks before Ukraine’s parliamentary elections on October 26, the party took a surprise 22.14% of the vote. It thereby pipped President Poroshenko’s eponymous party BPP, at 21.82%, to take the largest share of the vote – although BPP took more seats in parliament thanks to a strong showing in constituencies. The electoral success of People’s Front ensured that Yatsenyuk continued in his post of prime minister, with co-founders Arsen Avakov staying as interior minister and Oleksandr Turchinov remaining secretary of the National Security and Defence Council. But the ongoing economic collapse in 2015, combined with hostile media coverage by oligarchs and perceived slow pace of reforms, saw the party’s popularity evaporate as quickly as it had risen. Now there are growing calls for Yatsenyuk to merge his parliamentary group with that of BPP, in return for staying in the post of prime minister. The head of the parliamentary group of BPP, Yury Lutsenko, reminded on August 28 that he had proposed to Yatsenyuk one year ago that the two parties should merge and fight the elections together. There have also been frequent media reports in recent days predicting such a merger. BPP itself is only three weeks older than People’s Front, created exactly one year ago, but has weathered the storm better than its peer, since direct criticism of Poroshenko himself is still largely taboo in the media, given the quasi-wartime situation with Russia. Moreover, Poroshenko has established a Ministry of Information run by a close friend to counter negative news allegedly spread by Russia, which critics say is a powerful media weapon influencing pro-presidential coverage. BPP has itself just announced a merger with its close ally, the UDAR party headed by former boxer Vitaly Klichko, who is now mayor of Kyiv. An alliance between the two politicians was negotiated by oligarch Dmitro Firtash in Vienna in March 2014 in the run-up to presidential elections, and has worked out well for Poroshenko, with UDAR largely removed as a political competitor. Klichko has agreed to become leader of the post-merger party BPP. BPP’s rating is looking respectable at 23.5%, according to the KIIS poll, but worrying for Poroshenko, the rating of former prime minister Yulia Tymoshenko’s Batkyvschina party has surged to 22.7%, after taking only 6% in parliamentary elections. Batkyvschina is formally part of the governing coalition, but firebrand populist Tymoshenko has harshly criticised government decisions to hike utility prices paid by the population, fuelling her resurgent popularity. Moreover, Tymoshenko is widely regarded as a bitter personal rival of Poroshenko. The resurgence of Tymoshenko, together with persistent support for the equally populist Radical Party at 10%, and at 7% for the Opposition Bloc, the successor party to the ousted Party of Regions of former president Viktor Yanukovych, means that political opposition to the reform path in Kyiv is growing, additionally motivating the consolidation of pro-reform forces. “Although the center-right Poroshenko Bloc’s result of 24% is respectable, the only other reliably proeconomic reform party polling above 5% is Self-Help [party of mayor of Lviv Andriy Sadovyi, polling at 12.2%] ; this implies that difficult times may lie ahead for the passage of laws by parliament relating to economic liberalization,” comments Dmitry Churin of Eavex Capital.